The book of Chronicles covers the history of the chosen people from Adam up to the time of the Babylonian captivity, approximately 550 BCE. Chronicles is divided into two books, the first has the history from Adam through King David. It closes in a section devoted to the events of King David, particularly including the transfer of the Ark of the Covenant and the preparation for a temple (built by Solomon and described in the Second book of Chronicles.) The verse quoted is the opening of King David’s prayer, a song of thanksgiving. It praises God, recognizes David’s limitations and humble contributions, and pleas to persevere in righteousness. The prayer is a testament to King David holding him up as a model for all Israelites into the future. The praises recognize all belongs to God, all in heaven and earth, God is great and above all. It is the recognition that without God King David could not have accomplished anything. Yet, as David’s reign ends and his son Solomon becomes king it is a time of great prosperity and building. So God indeed favors the chosen people. 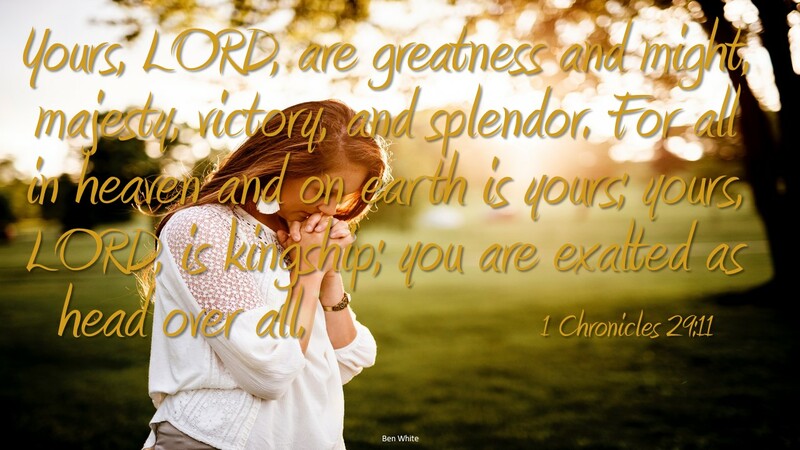 This acknowledgement of God’s kingship, greatness and complete authority over heaven and earth speaks of a nation who realize their full dependence on God. Giving God glory declares faith and belief in one true God, something unusual for a world with many deity. How do you proclaim the greatness of God? Do you proudly hold God as exalted?